North Korea's state media on Friday hailed the visit to Mount Paekdu by the leaders of the two Koreas as a "historic" event in an era of enhanced cross-border cooperation. President Moon Jae-in and North Korean leader Kim Jong-un climbed the peninsula's highest mountain Thursday, the last day of Moon's three-day trip to the communist state for their third summit. 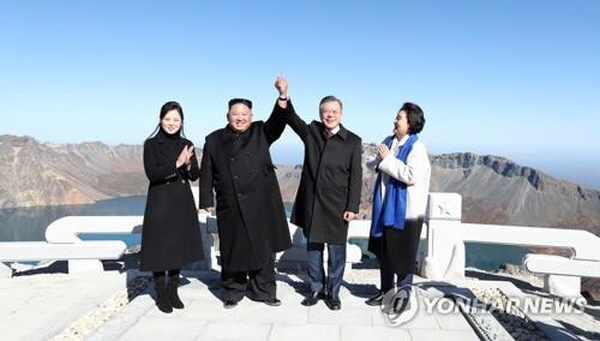 "On the ridge of Janggun Peak, the highest peak in range of Mt Paekdu, Supreme Leader of the Party, state and army Kim Jong Un together with President Moon Jae In feasted their eyes long on the natural beauty of the majestic and magnificent peaks, spectacular scenery of the limpid and blue Lake Chon and the wavy sea of foliage that extended vast reminding one of the blood vein of the nation," the Korean Central News Agency reported in English. "Moon Jae In expressed his impression of climbing the holy mountain symbolic of the soul and spirit of the Korean nation and voiced his expectation and conviction that the first step today would be followed by a new era desired by all the fellow countrymen," it added. The leaders' joint trip to the mountain underscored their commitment to bilateral rapprochement and cooperation, and reflected the positive sentiment following their talks on denuclearization, conventional arms control and economic cooperation. At this week's summit, Kim agreed to dismantle his country's long-range missile testing site in the presence of international inspectors and close its main Yongbyon nuclear complex should the U.S. take "corresponding measures."